The government will hold a meeting of infrastructure development companies and land owners by the end of this month to chalk out blueprints for setting up of satellite townships in the state. GS Bali, Transport, Technical Education and Consumer Affairs Minister, expressed disappointment today and suggested that Prime Minister Narendra Modi provide representation to the state in the Cabinet. Having lost the race for a berth in the Union cabinet, BJP leaders in the state are pinning hopes of inclusion on the Cabinet expansion. Himachal Irrigation and Public Health Minister Vidya Stokes today reiterated that the Pabbar gravity water supply project for Shimla was more viable and suitable to meet long-term water needs of the people. Rakesh Kanwar, Deputy Commissioner (DC), Kullu, heading the regulatory committee constituted to enforce river rafting safety rules, imposed a ban on river rafting in the Beas from yesterday till June 10, after it witnessed three fatal accidents in the past three months. With the National Green Tribunal (NGT) restraining the Himachal Pradesh Government from lifting ban on construction in 17 green belts of Shimla, the entire exercise to allow construction in these green patches has been put on hold, at least for the time being. The eight-day historic Minjar fair will be celebrated in Chowgan of Chamba town from July 27 to August 3. Facing flak for concentrating only on cases pertaining to the Himachal Pradesh Cricket Association (HPCA), the Vigilance and Anti-Corruption Bureau today gave details of the present status of all allegations contained in the Congress chargesheet. The first university to be created by conversion of a cluster of colleges under the Rashtriya Uchchatar Shiksha Abhiyan (RUSA) in Himachal Pradesh would come up at Mandi with the Government College, Mandi, as the lead college. A middle-aged man was injured when a leopard attacked him at Dalehri Rajputan village in Bangana block of the district today. Victim Kishan Chand was rushed to the district hospital with injuries on his thigh. On getting information that the animal was still hiding in a cattle shed, a team of the Forest Department was sent to trap the leopard. However, forest officials found the animal dead. The Consumer Forum, Mandi, while allowing a complaint regarding the sale of a second-hand car, that too of an old model to a complainant, has directed Sutlej Motors, Lunapani, Mandi, to replace the car sold to Nirmal Devi, a resident of Palampur, with a new one of “model 2014” of the same make within 30 days failing which it would have to refund the amount of Rs 6,44,713 (cost of the car), along with interest at the rate of 9 per cent per annum from the date of the filing of the complaint till realisation. An artificial lake has been formed 2 km away from Keylong due to the blockage of Billing nullah, following a massive landslide, which has created panic among area residents. A deputation of the Akhil Bharatiya Gaddi Janjatiya Vikas Samiti, led by president Lalit Thakur, met Bharatiya Janata Party Member of Parliament from Mandi Ram Swaroop Sharma at Dharwala on Saturday. Various stakeholders want the state government to clear its stand on the National Green Tribunal’s (NGT) order, wherein it had asked the government to regulate traffic and check pollution on Rohtang Pass by putting up another barrier at Kothi. The Rotaract Club launched a massive campaign for the rehabilitation of stray animals here today. The club had decided to shift stray animals to an animal home near Dheera, as several accidents were being reported due to these animals roaming freely on roads. Notwithstanding framing any regularisation policy for computer teachers who have been rendering services in government schools since 2001, the state is appointing PGT computer lecturers in these schools which has embarrassed 1,535 teachers across the state. With investors showing little inclination to employ persons with disabilities (PWDs), such youth are finding it difficult to find gainful employment. Newly-elected Mandi BJP MP Ram Swaroop Sharma on Saturday expressed hope that the Congress government in the state would extend cooperation in the execution of development programmes of the BJP-led NDA government at the Centre. People’s Voice, a social organisation, has urged the Union and state governments to display portraits of Bhagat Singh, Rajguru, Chandrashekhar Azad and other martyrs in government offices instead of political leaders. Residents of 12 panchayats in the town have demanded sewerage facility which is provided to municipal areas. The residents said 90 per cent of the town had been extended to the panchayat areas and the state government should provide them with a sewerage system. Dr Manmohan Singh, director of Shimla-based Meteorology Centre, informed 25 blind and deaf girls of Government Portmore School about nature, climate change and global warming. An antique shop at McLeodganj was burgled yesterday night. 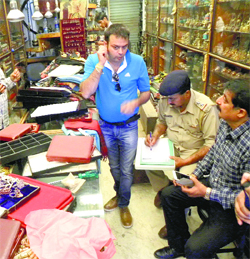 Police sources said burglars broke the shutter locks of “Mementos India” located near the main square of McLeodganj and took Rs 1.5 lakh cash and some antiques. An integrated township policy has been formulated by the Himachal Pradesh Urban Development Authority (HIMUDA) which is likely to be placed before the Cabinet in the next meeting. “We have received good response from investors as well as land owners who are willing to sell off their land for setting up of satellite townships and ease pressure on saturated towns in the state,” said Sudhir Sharma, Urban Development and Town and Country Planning Minister. The viewpoint of realtors who are keen to make investment running up to Rs 500 crore for a satellite township will be taken up at a meeting to be held in the state capital. More than six infrastructure development companies have expressed their desire to be partners in setting up of satellite townships. Infact, the state government has decided to invite Foreign Direct Investment (FDI) in the housing sector of satellite townships for the first time. The companies keen on investing in satellite townships are Noida-based 3C Universal Developers, which has a tie-up with a foreign company, Lotus Boulevard, Sandwoods Infrastructure Pvt Ltd, New Delhi, and Shrishti Infrastructure Development Ltd, Kolkata. “With several land owners also coming forward to provide land for the proposed satellite townships, we will hopefully be able to tide over the major constraint of land,” Sharma said. He said big chunks of land were being made available at Shimla, Kasauli, Mandi and Solan and about 500 bighas would be required for one site. Officials pointed out that it was only after the Cabinet approves the integrated township policy that the ball would be set rolling for starting the process for setting up of satellite towns in the state. The government is yet to decide on the crucial aspect of transferring the land in the name of private developers or keep it in its own name. The government proposes to set up five satellite townships with tentative locations being near Shimla, Solan, Mandi and Dharamsala. Besides, Shimla being the state capital, the other three towns too are buckling under pressure due to increasing population and tourist influx. Most of the towns, especially tourist destinations like Shimla, Manali, Dharamsala, are plagued with problems such as inadequate parking facility, poor roads and water shortage. Bali was addressing a press conference at his residence. He said there were six BJP MPs from the state in the Parliament, four in Lok Sabha and two in Rajya Sabha, but the state had no representation in the Cabinet. When Congress was heading the UPA government, Anand Sharma, VB Singh and Chandresh Kumari represented the state in the cabinet, despite the fact the state had only one MP in the Lok Sabha, he said. He added that the state had problems of railways, airports, telecommunication, food subsidies and human resource development, but none to place these issues in the Modi Cabinet. It was unfortunate that the Himachal Pradesh Central University had become the victim of politics and was put to a dock, he rued. Bali said in 2010 two Central Universities were sanctioned, one each for Jammu and Kashmir and Himachal Pradesh. After five years, two Central Universities were established in Jammu and Kashmir where as the wings of the only Central University were clipped by political vested interests in the state. The state leaders had high expectation that at least one minister or minister of state would be inducted in the Union ministry from Himachal. The state leaders are now optimistic that BJP general secretary Jagat Prakash Nadda, who hails from the state, could be elevated to the top post of national president. Former Chief Minister P K Dhumal said with most of the contenders for the top post being adjusted in the Union Cabinet, there were chances of Nadda being elevated to the top post. The move would be an honour for the state, he added. “If this happens, Nadda would be the first leader from the state to head a national party saddled in power at the Centre,” Dhumal said. State BJP president Satpal Singh Satti also shared the view that the state could get representation during the expansion of Modi ministry but added that “it is purely a prerogative of the Prime minister”. “Of course, Nadda’s elevation as national president would be a great honour for the state. It would remain in focus,” he said. “Development of Himachal Pradesh would definitely get a boost under Modi Government,” he added. Names of former Chief Minister and Union minister Shanta Kumar and Bharatiya Janata Yuva Morcha president Anurag Thakur are taking rounds for inclusion in the Cabinet. Presiding over a meeting of the Irrigation and Public Health Department here, she asserted that the financial viability of the project was more as compared to the Sutlej Lift water supply project. The cost of power for pumping would be about Rs 3,000 crore over a period of 30 years at the rate of Rs 100 crore per annum which would be prohibitive and borne by the state government, she said. The higher capital cost of Rs 800 crore would be wiped out and the operational cost would be low in the long run. The Public Health Minister said the state government was committed to provide un-interrupted supply of safe drinking water to the people of the town and was working in close co-ordination with line departments, so as to ensure proper distribution of potable drinking water. Stokes claimed that the previous government proposed the Pabbar Gravity Drinking Water Supply Scheme in 2008 and the scheme was appraised by the Government of India and sent to World Bank in 2009 for funding. She said the technical feasibility was certified by an independent consultant WAPCOS, a Government of India organization, engaged by the state government for the preparation of the detailed project report (DPR) which was submitted to the Government of India. She said the water availability through Pabbar project would meet the drinking water supply requirements of the capital town of Shimla till 2037. She said the previous government had mooted the proposal, but completely failed to start the project and now, it was terming the project as unviable and stressing upon lifting water from the Sutlej. Stokes said the total capacity of water in Shimla from all sources was 60 MLD and average quantity of water supplied from these sources was 45 MLD. However, the total storage capacity in Shimla was 20-40 MLD and the requirement of water as per the norms is 135 litre per person for a population of 2.50 lakh was 33.75 MLD. She said frequent electricity failure, water distribution losses on an average of 26.60 per cent and lesser storage capacity with the Shimla Municipal Corporation were the main reasons for erratic supply of water. She said appropriate directions were issued to the line departments to work in co-ordination regarding distribution and power supply so that un-interrupted water supply was ensured. Kanwar said in order to inspect equipments and licensed guides of the registered raft operators and ensure that proper system was existent, the regulatory and technical committee would conduct surveys of the operators on the entire stretch of the Beas in Kullu district. He said as per the norms laid by the state government, only one rafters’ association could be registered in one district and a new association, Kullu Valley River Rafting Association, headed by Bhuvnesh, had been recognised for this purpose. He expected that other operators would soon join and develop a self-regulatory mechanism to promote the adventure sport. He believed that there should be a common ticket and changing rooms be provided at the starting and ending points. The Tourism Development Corporation would assist in formulation of policies and steps required to ensure adherence of safety norms by the operators, he added. Captain Randhir Salhuria, director, Atal Bihari Vajpayee Institute of Mountaineering and Allied Sports, Manali, also heading the technical committee constituted to check the equipments and grant licenses to the operators and guides, said the committee would carry out its half-yearly inspection from June 3 to June 6. Periodical inspections were undertaken to check technical equipments and fitness of the rafts but there were no special team to maintain a constant vigil. In the absence of regular checking, the operators became very complacent, giving the norms a go by, the sources said. The state government has been compelled to put on hold the proposal to relax the 14-year-old ban on construction in these belts, which are considered the lungs of the town. On May 30, the NGT, acting on a petition filed by environmentalist YM Sengupta, issued orders restraining the Shimla Municipal Corporation and the state government from permitting construction in the 17 belts spread over 414 hectares and declared no-construction zone on December 7, 2000. It was after the constitution of yet another committee by the Town and Country Planning on May 28 that Sengupta decided to approach the NGT. The new committee had been set up to verify the physical and revenue boundaries of the 17 belts and identify the existing residential and commercial localities. The committee had been asked to submit its report by June 30. Presiding over a meeting of the Minjar Fair Celebration Committee here recently, Deputy Commissioner (DC) Kadam Sandeep Vasant, who is also the chairperson of the committee, said transparency would be maintained in the income and expenditure accounts of the fair. E-tendering with regard to major activities of the fair would be done, thereby bringing transparency, the DC said. Vasant stressed on the need for making excellent arrangements for the fair. To entrust the responsibility of various arrangements of the fair, sub-committees had been constituted for specific tasks like exhibition, sanitation, cultural programmes and allotment of stalls, he added. Giving details, Vigilance officials said a total of 53 complaints, contained in the Congress chargesheet, had been handed over for investigation. “While three cases pertaining to JP Associates have been handed over to the Special Investigation Team (SIT), 50 cases are being looked into by the bureau,” said a spokesperson for the bureau. He said out of the remaining 50 cases, investigations in 21 cases were on and in four cases, chargesheet had been submitted in court. In 10 cases, FIR had been registered and in seven cases, investigations were in full swing, he said and added that in the remaining 29 cases, investigations were being done in a fair and impartial manner. Hamirpur MP Anurag Thakur and former Director General of Police ID Bhandari had accused the Vigilance Bureau of only targeting the HPCA and not bothering with other charges in the Congress chargesheet. The state government had put forward three proposals in three districts for creation of the university but the project approval board (PAB) of RUSA has given approval in-principle to creation of the new university at Mandi. The fund allocation for the new university has been approved at Rs 55 crore and Rs 18.3 crore have been earmarked for the current financial year (2014-15). The distance norm of RUSA, requiring cluster colleges in the range of 15-20 km from lead college, has also been relaxed for the state, keeping in view the tough hilly terrain. But it would have to adhere to all the future commitments as detailed in the programmatic norms and submit a detailed project report. Creation of new universities to reduce the pressure on existing universities was an essential component of academic reforms under RUSA and 80 new universities would be created in the country during the 12th plan, by converting autonomous colleges in a cluster and ensuring that a number of colleges affiliated to a university do not exceed 100. At present, Himachal Pradesh University is the only affiliating university in the state with over 200 colleges and the new university would reduce its burden. The implementation of RUSA would entail an expenditure of Rs 98,134 crore over the 12th and the 13th plan and funding would be shared between the Centre and the states in the ratio of 65:35. For northeastern states, Jammu & Kashmir and Himachal Pradesh, the Centre and state funding would be in the ratio of 90:10. Over the two plans, the Centre's share would be Rs 69,675 crore and that of states Rs 28,459 crore. During the remaining period of the 12th Plan, RUSA would have an outlay of Rs 22,855 crore, of which Rs 16,227 crore will be the Central share. It is expected that by the end of the 13th plan, 278 new universities and 388 colleges would be created and 266 colleges would be converted to model degree colleges while 20,000 faculty positions would be added. However, state governments would have to fulfill a set of conditions before seeking funds from RUSA and create State Higher Education Council (SHEC) and lift the ban on filling faculty positions. Further, the universities would have to introduce semester system, seek mandatory accreditation, usher in affiliation reforms, introduce semester system and choice-based credit system, bring curriculum development and make the admission procedure transparent. Three other persons, who rushed to save Kishan Chand, were also attacked by the cat. The village is located on the edge of a dense forest. Sources said Kishan Chand was going towards his cattle shed to feed the animals about 1.30 pm when the incident took place. On seeing the leopard, Kishan Chand rushed towards his house while shouting for help. On hearing the shouts, three locals rushed towards the shed. The leopard left Kishan Chand and attacked the three, who received bruises. Divisional Forest Officer (DFO) RK Dogra said an immediate relief of Rs 5,000 had been given to the victim. Dogra said a team under a forest range officer was dispatched to the village to capture the animal. He said when the forest officials reached the village and opened the cattle shed, they found that the leopard had already died. Forest officials said the animal was a two-year-old male. The DFO said the animal had injury marks on his neck and the wounds were infested with insects and larvae, suggesting that the injuries were not fresh. He said the animal might have entered into a duel with another leopard over territorial issues. He said the animal, in search of a safe place, had reached human habitations, adding that a post-mortem examination would be conducted and a case had been registered for further investigations. About a week ago, a leopard was captured from the Takoli panchayat area in the same block and sent to the Gopalpur zoo. The Forest Department had reported that the captured leopard was a 10-month-old male with an injured leg. The DFO said, “Forest fires caused by locals are one of the reasons why these animals are moving towards human habitations.” He said cubs of the last breeding season were still inexperienced hunters with age just about 8 to 10 months. He said these young leopards search for easy prey like dogs and when confronted by humans, they get frightened and tend to attacks. It further directed Satluj Motors, Lunapani, to pay an amount of Rs 20,000 as compensation to the complainant for mental harassment and Rs 5,000 as the cost of the complaint. As per facts of the case, the complainant purchased a car on April 5, 2012, and paid an amount as demanded by the opposite party, but no bill was issued to her. It was collected by her after repeated requests. Only an insurance cover note was given to her at the time of the delivery in which the model of the car was shown as “2012”. At the time of the delivery, the car had already covered 70 km and on inquiry it was stated that it was delivered at the Hamirpur branch, from where it had been brought by road. The complainant alleged that when she took the car for first servicing on May 13, 2012, at an authorised service station in Kangra as per the record maintained by an online system, it was found that the owner of the car was Keshar Singh Thakur of Panarsa, Mandi, to whom it had been sold on March 30, 2012. The opposite party denied that the car was earlier sold to Keshar Singh and then to the complainant. As per a reply filed by the authorised service station of the company in Kangra, the car in question was found billed in the name of Keshar Singh as per the online system. The forum said the complainant was sold a 2011 model car saying that it was of 2012 model. This amounted to not only deficiency in service, but also unfair trade practice. The landslide was caused due to the melting of glacier and intermittent rainfall, leading to the formation of a 250-mt long artificial lake. Residents fear the lake may flood anytime posing threat to the 400 KW HIMURJA power project. Not only this, the gushing water also inundated about 15 bigha agricultural land and damaged three houses. However, no loss of life was reported. Lahaul and Spiti DC Bir Singh Thakur and the SDM visited the spot. They have asked people to take necessary precaution. A team of geological experts would be called to find out the reason for the sudden increase in discharge of water in the nullah, the DC said. Meanwhile, the BRO has opened the road up to Parchu. They presented Ram Swaroop Sharma a memorandum with regard to neglect of non-tribal areas. In the memorandum, the samiti urged the Bharatiya Janata Party MP to take up the issue of granting tribal status to 21 non-tribal panchayats which fall in the Bharmour tribal Assembly constituency. These panchayats are Mehla, Bakan, Bandla, Choori, Darwin, Gurad, Dulara, Preena, Radi, Sunara, Brehi, Gehra, Lech, Kilod, Chhatrari, Piyuhra, Baloth, Kuned, Khundel, Kunr and Lothal. The protesters revealed that 95 per cent villages of these panchayats were deprived of roads, education and health facilities. Since the area had the similarity of language and culture with the Bharmour tribal area, it could be granted the tribal status so that the area and its residents could derive the benefits of tribal areas, Lalit Thakur said. They said the “double green tax”-- one at the entry point of Manali and another at Kothi barrier -- had hit the tourism industry in the Kullu-Manali-Lahaul-Spiti circuit. They said the occupancy had dipped to 60 per cent even during the peak summer season due to protests against the “double tax” last week in Manali that led to cancellation of bookings. “The occupancy in big hotels hovers around 70 per cent while in other hotels it is 50 per cent,” they said. They said the district administration had put up a barrier at Kothi to regulate tourists to the 13,050 ft high Rohtang Pass, a major tourist attraction. “Tourist vehicles first pay Rs 200 as congestion charges at the Green Tax barrier set up near the entry point of Manali. They pay Rs 200 for small cars and Rs 500 for buses or heavy vehicles. Now, tourists are being asked to pay Rs 50 for small cars and Rs 100 for heavy vehicles at Kothi as well to reach Marhi and they are not allowed to visit Rohtang even. This has hit the tourism industry in the valley, as tourists feel cheated,” rued a member of Manali Hoteliers’ Association (MHA). “We have taken up the matter with Chief Minister Virbhadra Singh as well and he has assured us that he will look into it,” said AR Thakur, president, MHA. “The previous government did nothing and the present government has also not cleared its stand,” he said. There were suggestions to open Bhrigu and Hampta valleys to decongest Rohtang Pass, but the government had done nothing so far, Thakur said. Tourist operators said the Alain-Duhangan hydro project at Hamta valley was yet to supply electricity to Manali and the government had not spoken to the project heads to open the barrier for the public. Experts suggest a package-based integrated stay model (PBIS) to ease out the mad rush to Rohtang Pass and to manage tourists in Kullu and Manali. He said he had submitted the model to the NGT, chief minister and chief secretary to seek relaxation. He also cited Chief Justice AM Khanwilkar and Justice RB Mishra’s order on Rohtang passed in 2013, saying that there should be zero tolerance level with regard to pollution in Marhi and Rohtang. During peak season, as many as 4,000 vehicles leave for Rohtang Pass in a day. Manali has 1,800 taxis and the rush can be managed as per the PBIS model, he added. This model would help hundreds of local residents of Lahaul and Spiti and Pangi, as they are the ones who suffer due to heavy rush after getting stuck in traffic jams, he said. He said the club had made arrangements to pay ~2,500 per animal to the animal home, adding that it had fixed ~100 per animal as adoption charges. He appealed to local residents to come forward and cooperate with the Rotaract Club and adopt an animal by paying ~100 to the club as adoption charges. He said there were over 200 stray animals in the town and it was a very difficult task to shift all animals to the animal home in a phased manner keeping in view the capacity of the animal home to accommodate so many animals. Butail also urged the state government to extend its cooperation to the club for this noble cause and direct government officers to help. Stating this here today, association state president Daljeet Minhas said the hapless teachers were being exploited by private companies. “With the appointment of PGT computer lecturers in schools, computer teachers are feared for their retrenchment and are likely to be rendered jobless ,” he lamented. The opportunities are already scarce in the public sector, but they are hopeful that industrial units will provide them some support. Their hopes have, however, been dashed as little employment opportunities are available to them. Figures available with the Labour and Employment Department reveal that nearly 16,946 persons with disabilities have registered themselves with the department. Though some investors had come forward to train these youth according to their disabilities and absorb them in their units, the number was few. Baddi-based Elin Appliances is one such unit which, despite facing limitations, has not only set an example by employing several such people, but also endeavouring to employ 10 per cent of their workforce from among the persons with disabilities in the next five years, confided the plant head JS Kang. Another unit manufacturing machine parts has also come forward to employ girls suffering from such disabilities in Parwanoo area. Labour Commissioner Nandita Gupta said to assist these PWDs, a special cell had been set up by the Directorate of Labour and Employment which gave them vocational guidance so as to help them in getting jobs in the private sector. She said the youth having minimum of 50 per cent disabilities were also extended Rs 1,500 as monthly skill development allowance which was Rs 500 more than that given to the other youth so that they could acquire employable skills. Arun Rawat, president, Confederation of Indian Industries, Himachal Chapter, said there was a disconnect between employers and such youth and there was a little information available on how to approach such people. He said awareness in the form of job fairs should be held which could provide a common platform to employ such youth. However, he warned that the BJP would resort to agitation if the state government became a hindrance in the implementation of Centrally-sponsored schemes and development programmes in the state. Addressing mediapersons here, Ram Swaroop, who is also the vice-president of the state BJP unit, said the pending development projects of former CM Shanta Kumar would also be completed. Sharma said the issue of 21 non-tribal panchayats falling in the Bharmour tribal Assembly segment, a part of the Mandi Lok Sabha constituency, would be taken up with the Centre for granting ‘tribal status’ so that the residents could get benefits. “I will remain engaged in fulfilling the promises made by me during the Lok Sabha elections”, he said. In his thanksgiving tour to Bharmour Assembly segment, Ram Swaroop said efforts would be made to undertake work on the Holi-Uttrala tunnel to link Bharmour with Kangra district. Chamba BJP MLA BK Chauhan was also present at the press conference. Welcoming the decision of Prime Minister Narendra Modi, who had directed the Gujarat Government not to include a chapter on his biography in school textbooks, the organisation also opposed the installation of statues of the leaders who are still active in politics. Addressing mediapersons here today, KB Rahlan, Neelam Sood and Daleep Sharma, functionaries of the organisation, said the Union government should issue guidelines to the states in this regard. They said the government should teach new generation about the sacrifices made by martyrs for the unity and integrity of the country. They said the state government had completely neglected the martyrs belonging to the state. They said the state government must give due regard and respect to its martyrs such as Capt Vikram Btara PVC), Major Somnath Sharma (PVC), Capt Saurabh Kalia and Suhdheer Walia (Ashok Chakra). They asked Chief Minister Virbhadhra Singh to introduce chapters in the school textbooks highlighting the sacrifices made by the state youths for the nation. They said despite repeated assurances by the successive governments to protect the environment as well as to make the town a tourist destination, nothing had been done so far. With the onset of summer, blocked drains and heaps of garbage welcomed tourists visiting the tea town of the state. Official sources said a Centrally sponsored sewerage project for the satellite areas of the town was sanctioned in 2006 at a cost of ~9 crore. But with the change of guards in the state in 2007, it was shelved, they said. Now, the cost of the project has gone up to ~24 crore and the state government has expressed its inability to go ahead with the project due to shortage of funds. People’s Voice, a voluntary organisation, condemned the step-motherly treatment meted out to the town by the Congress government in the state. 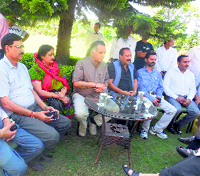 Addressing mediapersons here yesterday, KB Ralhan and Neelam Sood, spokespersons of the organisation, said in the absence of comprehensive sewerage system, it would give rise to vector-borne diseases and spell a doom for the residents as well as tourists visiting the town. They said non-availability of ~24 crore was nothing but a non-cooperative attitude of the state government towards the development of the town. Police officials said the value of antiques was being assessed. A large numbers of thefts have been reported in McLeodganj area in the past few days. In the recent past, a senior police official from Punjab lost his camera lens worth about Rs 1.5 lakh after thieves stole it from his car parked on a roadside in McLeodganj. Some people attributed the car thefts to influx of a large numbers of taxi drivers or private cab drivers coming from adjoining state to McLeodganj. However, now that an antique shop has been burgled right on the main square of McLeodganj, the role of some locals cannot be ruled out. Thefts and pick-pocketing reports were common during melas that are organised in Dharamsala and its adjoining areas. The trace ratio of these theft cases was very low and the police generally files closure reports in the court.